Preheat oven to 350 F. Coat muffin cups with cooking spray. 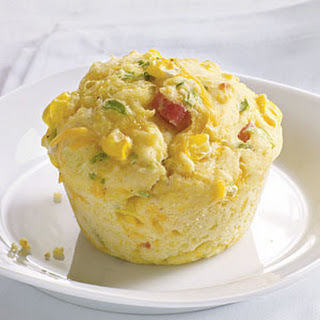 Combine flour, corn meal, sugar, baking powder, milk, oil, egg and MacYourself Cheddar Cheese Powder; until well mixed. Gently fold in ham, and chives or scallions. Spoon the batter into the prepared cups, filling each three-quarter full. Sprinkle with shredded cheddar cheese. Bake the muffins until their tops are lightly browned, about 20 minutes. Let them cool in the pan on a wire rack for 3 minutes, then turn them out onto the rack and let them cool completely. The muffins can be frozen in a plastic freezer bag for up to three months.